Ever since its inclusion into newspapers, Sudoku fever has swept across the nation, knocking its predecessor, crossword puzzles, down a peg in popularity. A simple concept with minimal trappings, it is a puzzle that can be played anywhere, by anyone. Water Planet Development now has an app version for the iPhone and iPod Touch: GemSudoku. If you’re not familiar with the game, you are given a 9×9 grid made of nine 3×3 sub-squares with some numbers filled in. The objective is to fill in all the empty squares so that each column, row, and sub-square contains the numbers from 1 to 9. However, no digit can be repeated in the same column, row, or sub-square. 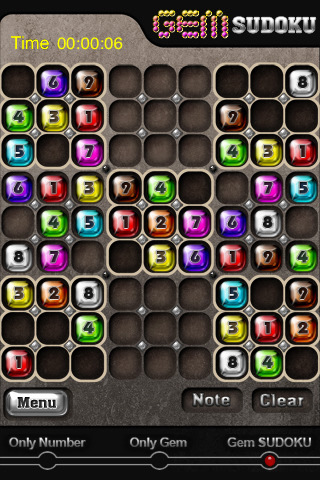 The playing board of GemSudoku takes place on the same 9×9 grid, except this time the numbers also correspond with a unique gemstone. It can be pretty confusing at first, since there are nine different colors appearing nine times on the screen, but once you get used to colors, they actually help you figure out what numbers go where. If it’s still more of a hindrance than helpful, there’s an option to display the numbers only on the bottom of the screen–but don’t be boring, give the gemstoned numbers a try! If you’re more of a visual person, there’s also an option to display the colors only, but it’s not really Sudoku without any numbers. GemSudoku has three difficulty settings: Easy, Medium, and Hard. The way the game ranks you is by time–the faster you solve the puzzle given, the higher your rank is in the respective difficulty level. The gemstones are beautifully rendered, but I could stand to have a different font for the numbers; sometimes it was hard to make out the number, and I had to resort to using the gemstone color to tell. The worst thing about GemSudoku is the background music, but you can turn it off (and it seems to stop by itself after one or two loops, anyway). If you’re a Sudoku fan, definitely give GemSudoku a shot. Update: GemSudoku has finally released an update that answered most my color scheme concerns–I feel so special! This latest version features a completely reworked playing board, with retina display support and numbers you can actually see. The mechanics of the game remain the same and all the same buttons are still there, but overall it looks cleaner and more polished. The song that greets you upon launching stops within a minute of the game, and you can turn off the sounds (which I did, because I found them sort of annoying instead of cutesy). If you still have trouble seeing, just zoom in on the board! GemSudoku remains my go-to for gorgeous puzzle solving action. AppSafari review of GemSudoku was written by Julie Guan on July 2nd, 2010 and categorized under App Store, Fun, Games, Puzzler. Page viewed 3478 times, 3 so far today. Need help on using these apps? Please read the Help Page.